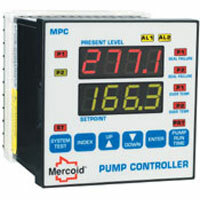 Pump Controller provides versatile level control. 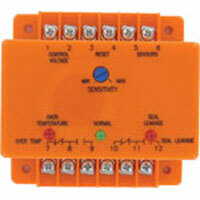 Featured two additional programmable alarm contacts with front alarm light indication. Applications are oil tanks and reservoirs. Quadraplex Pump Controller is where four pumps are required to alternate to provide equal run time on each. The loads are energized in the same manner as the SOSO sequence. 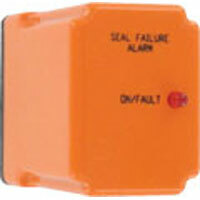 Single Channel Leak Detection Relay monitors the shaft seal of a submersible pump to detect a leak before pump failure. When seal failure condition clears the relay automatically resets. 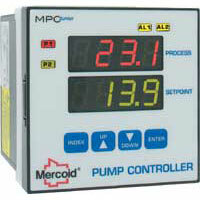 Pump Controller provides versatile level control. Designed for use with style level transmitters. 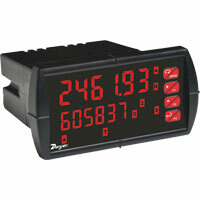 Flexible and incorporates a user-friendly programming menu. 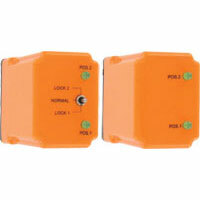 Duplexing Pump Controller is used where two pumps are required to alternate to provide equal run time on each. Two LED indicators show the load energized by the SPDT output relay. Leak/Over Temperature Detection Relays monitor the shaft seal and the stator temperature of a submersible pump to detect a leak. 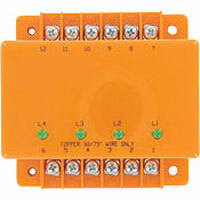 Installation is made simple with a surface mount configuration. Dual Channel Leak Detection Relay monitors the shaft seals of two submersible pumps to detect a leak before pump failure. 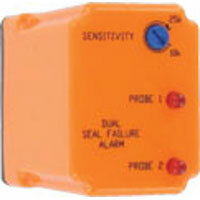 Leak is detected by sensing the status of a float.